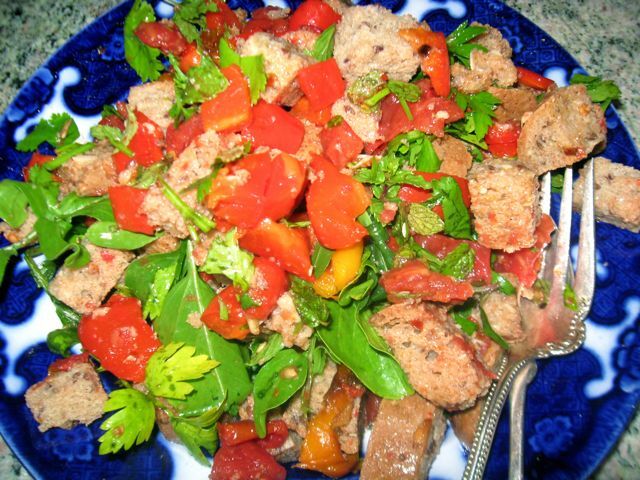 Panzanella, the classic Mediterranean tomato-bread salad, is a great way to play up tomatoes at their peak and use up tired bread, too. Plus, it feeds a crowd. You can stretch and embellish it by adding any number of ingredients, including drained chickpeas, chopped cooked green beans, Kalamata olives, diced cucumber, or chopped roasted peppers, but at heart, the recipe relies on good bread and ripe tomatoes. Panzanella can be heavy on the oil. Here, the dressing features the collected juice of chopped tomatoes, keeping it light and bright. Place the smashed garlic and diced tomatoes in a colander over a bowl, so you catch all the tomato juice. Leave in a cool spot for an hour or longer, or refrigerate overnight. Whisk the olive oil into the accumulated tomato and garlic juices for a minute or so, until emulsified. Add the cumin, coriander, and red-pepper flakes. Whisk in the vinegar. Tumble the bread cubes onto a generous platter or serving bowl. Pour half the dressing over the bread. Mix gently. Wait a few minutes so the bread can absorb the flavors. Scatter in the herbs, then the tomatoes. Add the remaining vinaigrette, mix gently, and serve. This recipe doubles easily, and is sturdy enough to handle sitting around for a while at a picnic or buffet.